Background: Moderate to high intensity activity is an important component in weight loss. The ability to use free technology to monitor activity would provide a useful clinical tool. Methods: Three popular pedometer mobile applications (“iSteps Lite”, “Pedometer Lite” and “Lyr Free”) were compared to a conventional pedometer. Outcome measures included step recording, speed estimate, distance recorded over a fixed distance and steps recorded during car travel. Results: All devices show inaccuracy in step count and speed estimate at varying intensities of activity. For measurement of 100 steps at medium intensity activity, the range of recorded step counts detected at medium sensitivity was 69.3 to 101.3. Valid and reliable results for step count were seen with the control pedometer and with one program at moderate sensitivity settings for moderate and high intensity activity. The most accurate distance recorded and estimate of speed over a fixed distance was from a program with Global Positioning System (GPS) functionality. Conclusion: It is possible to determine a step count as accurate as a control pedometer with careful selection of program and calibration. When exercising over a distance, a program with GPS functionality leads to the most accurate determination of speed estimate and distance recorded. The link between exercise and weight loss has been well established, and guidelines on recommended exercise patterns have been developed by many leading health organizations.1Australian Government Department of Health and Aging,2Royal Australian College of General Practitioners Moderate or high intensity activity has been shown to be more effective in weight loss than low intensity activity.33. Swain DP, Franklin BA, Comparison of Cardioprotective Benefits of Vigorous Versus Moderate Intensity Aerobic Exercise. American Journal of Cardiology 2006;97(1):p141-147,4 It has been demonstrated that overweight individuals who are successful in losing weight and maintaining a healthy weight range are likely to have similar daily periods of high intensity activity when compared to age and gender matched individuals in a healthy weight range.5Tooltip Text These individuals also demonstrate increased periods of high intensity activity compared to matched obese subjects.5Catenacci VA, Grunwald GK, Ingebrigtsen JP, Jakicic JM. Physical Activity Patterns Using Accelerometry in the National Weight Control Registry. Obesity 2011;19(6):1163-70 Accelerometers and pedometers have been used as inexpensive means of monitoring an individual’s ability to meet recommended activity levels.6Sugden JA, Sniehotta FF, Donnan PT, et al. The Feasibility of Using Pedometers and Brief Advice to Increase Activity in Sedentery Older Women – A Pilot Study. BMC Health Serv Res 2008;8: 169 When clinically tested,7McBride GB. A proposal for strength-of-agreement criteria for Lin's Concordance Correlation Coefficient. NIWA Client Report: HAM 2005-062,8Cyarto EV, Myers AM, Tudor-Locke C. Pedometer accuracy in nursing home and community-dwelling older adults. Med Sci Sports Exerc. 2004;36:205–209 significant inaccuracy has been shown when estimating calorific expenditure, step count and distance, when pedometers are used with low to moderate intensity activity. Inaccuracy can be further compounded by activities of daily living that trigger the recording mechanism, for example, whilst driving. However, when used for monitoring moderate to high intensity activity, pedometer devices show acceptable accuracy, and given this is the intensity of exercise of most interest to clinicians, pedometers can be useful clinical tools. Recently, with the development of more sophisticated mobile phone technology (‘smart phones’), many commercially available phones are now equipped with a built in accelerometer, which can be utilized by pedometer applications, which are able to be downloaded from the internet. Hence, there is now potential for a patient’s own mobile phone to be used as a ‘pedometer’ for exercise intensity monitoring purposes. This may mean the ability for medical practitioners to monitor compliance with exercise advice may be simplified, and may only involve downloading an application onto a patient’s mobile phone. Furthermore, many pedometer applications allow adjustment of individual user characteristics and sensitivity levels, whilst others can utilize Global Positioning (GPS) technology, all of which may improve accuracy when compared to conventional commercially available pedometer devices. We conducted a prospective observational study which aimed to investigate the accuracy of the most popular free of charge pedometer applications available for download to mobile phones equipped with an accelerometer. We hypothesized that the accuracy of pedometer applications easily available for download to ‘smart phones’ would be comparable to traditional pedometer devices. 1. The program should be free of charge indefinitely after download. Applications with a free trial period of finite length were not included. 2. The program should have full and efficient functionality after downloading, without additional software download being necessary. 3. 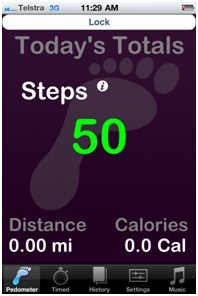 The application must record the number of steps taken, average speed and total distance. 4. The applications must have the functionality to record and upload exercise data to a computer. 5. The applications must have adjustable sensitivity settings. The selected pedometer applications were compared to a Yamax Digi-Walker SW-700/701 pedometer (Yamasa Tokei Keiki Co. Ltd., Tokyo, Japan) as a control. The control device was used in conjunction with an electronic stopwatch to allow speed and distance calculations to be made. An iPhone case with belt clip was used to secure the iPhone beside the Pedometer on the waistband. The pedometer applications were tested for their ability to record the number of steps taken on a treadmill set at 3, 6 and 9km/h speed settings, with the program set at its minimum, medium and then maximum sensitivity settings (0, 50%, 100%). If the program was able to self calibrate, a further recording would be taken at each speed after calibration. The programs were then further tested for their accuracy over a 1km distance and over a pre-planned route, with the application set at medium sensitivity. This would allow programs with GPS functionality to improve accuracy. Finally the amount of steps recorded during a 1km car trip was recorded at variable sensitivity settings, to estimate the degree of possible confounding due to background movement. A single subject and a single observer were used for all the trials. Relevant characteristics such as height (165cm), weight (59kg), gender (female) and stride length were into entered each program. Stride length was measured as 60cm at 3km/h, 75cm at 6km/h and 1m at 9km/h. Statistical analysis was performed using MedCalc Version 12 (MedCalc Software, Belgium). A result would be deemed valid if the step count was within 20 steps of the actual count. For a speed measure the result would be valid if the speed was within 0.5 km/hr of the actual speed. A result for step count or speed would be deemed reliable if the relative standard deviation of results was less than 1%. Strength of agreement was evaluated through concordance correlation coefficients (pc) where less than 0.90 was deemed poor; 0.90 to 0.95 moderate; 0.95 to 0.99 substantial; and greater than 0.99 to be perfect7. Student’s t-tests were conducted to compare the means of step counts, speed and distance measurements of the pedometer applications with the control pedometer. A significance value of <0.05 was considered statistically significant. Ninety results were returned when conducting a search using the search terms ‘pedometer’ and ‘free’ on the iPhone 4 ‘App Store’ application. Fifty-five of these reported functionality as a pedometer or accelerometer, but only three applications met all inclusion criteria. The most common reasons for exclusion was the inability to record or upload activity data, inability to adjust sensitivity, or significant functional restriction placed on free versions of the software. iStepsPLitePetar Dinev, http://pdinev.blogspot.com/): Calculates distance based on entered stride length, average speed, calorie expenditure and number of steps taken. Application data is formulated independently of GPS function, sensitivity is adjustable, and data can be recorded and downloaded to a computer. This application also features music player and map linking functions (Figure 1). Pedometer Lite (Luminant Software, http://luminantsoftware.com/): Calculates distance based on preset stride length for a participants height, average speed, calorie expenditure and number of steps taken. This application has self calibration capability, able to track distance using inbuilt GPS, has adjustable sensitivity and can record and download exercise data. This application also has music player functionality (Figure 2). 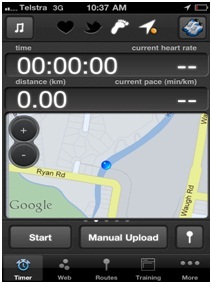 LYR Free (LogYourRun.com): Calculates distance using GPS function alone. 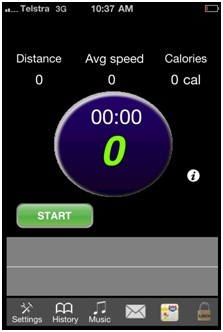 This application utilises the phone accelerometer to calculate steps taken when the GPS signal is weak or when the subject is not moving in relation to the GPS satellite, for example when exercising on a treadmill. In these circumstances, the application calculates distance travelled, speed and calorific expenditure based on multiplying the number of steps recorded by a pre-entered stride length. This program offers online support, offers maps which may be downloaded from the internet and provides trip information statistics. Adjustable sensitivity settings, ability to record and download exercise history data and music player functionality are also provided (Figure 3). At low speed (3 km/h), both the control pedometer and pedometer applications were inaccurate in recording speed and number of steps taken. (Table 1) The control pedometer had a relative standard deviation (SD) of 30.5% and 31.5% and was not found to have validity or reliability. The pedometer applications were also inaccurate, with none of the applications found to be both valid and reliable for both speed estimate and step count. At medium speed (6km/h) the control pedometer was found to be accurate in determining number of steps and speed, with only a relative SD of 2.0% for calculating step count, and 0.6% for calculating speed. (Table 2). iStepsP Lite at the medium sensitivity setting, and the Pedometer Lite at the self-calibrated setting were found to be both valid and reliable at recording number of steps and average speed at 6km/h. With regard to speed calculation over the 1km jog, the pedometer applications speed estimate generally correlated poorly with the actual speed calculated using an electronic stopwatch. (Table 4) Only the LYRFree application had a moderate correlation with actual speed, with a concordance correlation coefficient of 0.90. Finally, the amount of background false steps recorded during a 1km car journey is shown in Table 5. This was found to be generally high in the pedometer applications at high sensitivity settings, whilst it was low in the case of the control pedometer. As has been observed in previous studies,(8Cyarto EV, Myers AM, Tudor-Locke C. Pedometer accuracy in nursing home and community-dwelling older adults. Med Sci Sports Exerc. 2004;36:205–209,9Le Masurier GC, Tudor-Locke C. Comparison of Pedometer and Accelorometer Accuracy Under Controlled Conditions. Department of Exercise and Wellness 2003; 35(5):867-71) the accuracy of the pedometer applications and the control pedometer device is affected by activity intensity. Low intensity activity showed a higher relative standard deviation in the number of steps recorded and estimated speed, compared to moderate or high activity. Results for low intensity activity for all programs, as well as the control pedometer showed poor reliability and validity. 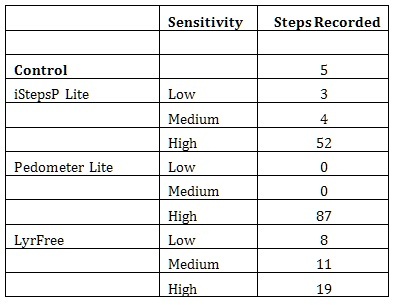 The option of increasing sensitivity settings on the programs tested did allow Pedometer Lite to record an accurate step count (4.1% relative SD) and LyrFree to record an accurate speed (6% relative SD), but these sensitivity settings were not reliable and valid for all activity intensity levels. At moderate and high intensity activity, the control pedometer showed an acceptable relative standard deviation. iStepsLite on a medium sensitivity also showed reliability and validity for moderate and high intensity activity and was comparable to the control. All other programs were not as accurate as the control pedometer, and results showed varying degrees of reliability and validity, which also highlighting the need to choose an accurate program and calibrate for the intensity level undertaken. When estimating speed, all programs and the control used a preset stride length multiplied by step count to determine the distance covered in a recorded time. The compounding effect of inaccuracy in estimating step count and discrepancy between actual stride length and a fixed stride length was seen in a higher relative standard deviation for estimate of speed than in step count, and shows a weakness in all programs and pedometers relying on this method of determining speed. When considering estimation of distance in a pre-set 1km run, LYRFree was found to be the most accurate of all the applications. It was also more accurate than the control pedometer with a concordance correlation coefficient of 0.9 compared to 0.1. This program operated with full GPS distance measurement in preference to step count. PedometerLite also had GPS functionality but did not show an improvement in distance and speed calculation, and did not appear to use the GPS preferentially when determine distance covered. While the control pedometer did have reasonable distance calculation and speed estimate, once again the inaccuracy in determining speed or distance using a preset stride length and recorded step count was apparent. Car travel led to false recording of additional steps for all phone applications as well as the control pedometer. As expected more false steps were recorded with the higher sensitivity settings. An accurate step count can be achieved with a free downloadable application by careful selection of program and manipulation of sensitivity settings, but this adds a level of difficulty and therefore a barrier to use of these programs as a simple clinical tool. When considering that the goal of the physician is to track physical activity, distance calculation and speed is far more beneficial to the clinician than step count. The use of GPS by LYRFree shows clear advantages over the control pedometer to determine the most accurate speed and distance. Furthermore the ability to upload and monitor progress, create or download routes, and set up a training program, are all additional benefits of this technology. In our study one control pedometer was tested. There are likely varying degrees of accuracy over the range of pedometers available, some may be more accurate than the control pedometer tested. Given most pedometers have a similar mechanism of detecting steps and recording distance covered through fixed calculation of stride length, they could be predicted to display similar inaccuracies to our control pedometer without GPS support. Further limitations included using only free pedometer programs, while paid programs may be more accurate or more functional. Our aim was to determine if programs that were free for patients could be as effective as a bought pedometer, for those who did not want to purchase a device. A final limitation from our paper is that the programs were required to be turned on and run in the foreground to record steps. This requires patients to activate the programs at the beginning of an exercise period. An advantage of this is prevention of false recording of steps during other daily activities such as driving. As the exercise of most interest is moderate to high intensity, as opposed to activity throughout the day, if the patient was compliant with activation of the device, this would not decrease the pedometers usefulness as a tool to record exercise periods. Accuracy and utility of the downloadable programs lags behind the use of a commercially available pedometer when determining step count. It is possible to manipulate settings to improve step count accuracy at one activity level, but recalibration is required as intensity of activity changes. A weakness in both commercially available pedometers and pedometer applications is the inaccurate determination of speed and distance when a preset stride length is required for estimation of speed and distance. Use of GPS can overcome this problem and provided the most accurate results from our testing. Despite their limitations, the potential exists for pedometer applications to be a useful clinical tool in the primary care setting. Please check plan options with your carrier before using these programs, as downloading applications, connecting to the internet or using GPS support may not be covered by your plan.